In a video, Aldave et al., from the Division of Pediatric Neurosurgery, Texas Children’s Hospital, Department of Neurosurgery, Baylor College of Medicine, presented a case of a 6-yr-old girl with a large sellar-suprasellar craniopharyngioma. The fact that the sphenoid was not pneumatized and the chiasm was elevated 1.2 cm from the planum sphenoidale were some of the reasons to choose a subfrontal infrachiasmatic approach as they discuss and show in the video. This approach has not been very well established in the literature but they demonstrated it can become a good alternative for a particular type of sellar-suprasellar tumors. Appropriate video authorization consent was obtained from the parent of the patient 1). Aldave G, Zinn P, Whitehead WE. 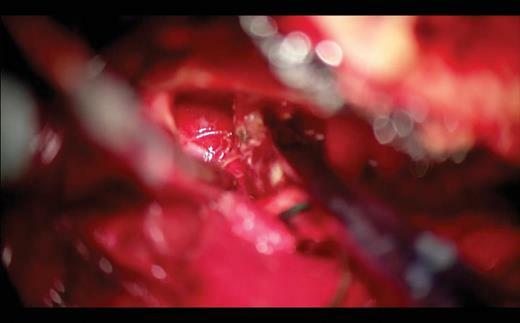 Subfrontal Infrachiasmatic Approach to a Craniopharyngioma Resection: 2-Dimensional Operative Video. Oper Neurosurg (Hagerstown). 2019 Feb 5. doi: 10.1093/ons/opy403. [Epub ahead of print] PubMed PMID: 30726971.